Regional airline Flybe is to end jet operations at four UK airports as part of its strategy to reduce its aircraft fleet. 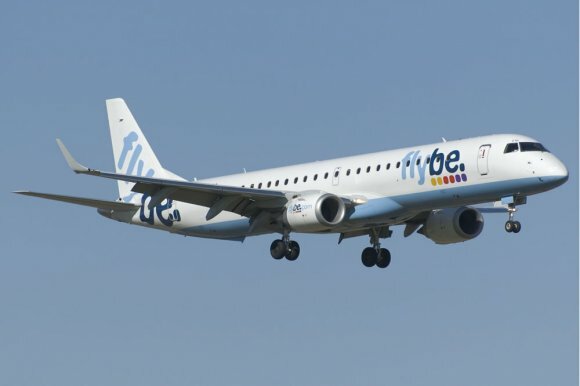 On the same day the airline was forced to cancel dozens of flights, Flybe has confirmed it will end jet operations from Exeter, Norwich, Cardiff and Doncaster Sheffield airports from the start of the 2019-20 winter season. The carrier said the decision follows a review of its bases as part of its strategy to reduce its fleet and return all of its 118-seat Embraer 195 aircraft to its lessors. At Exeter, where the airline is headquartered, Flybe will cease jet operations on 26 October 2019, but the move will not affect its Q400 schedule and the airport’s existing base structure. At Cardiff and Doncaster, Flybe will close its bases once jet flights cease, but will continue to fly to and from the airports with Q400 aircraft and crew flying from other bases. At Norwich, Flybe will only continue with services operated through its franchise partner Eastern Airways once jet operations come to an end. Flybe chief executive Christine Ourmières-Widener said: “Our fleet reduction has always been core to improving our profitability. We are committed to assisting all our affected employees across the impacted Flybe bases. Flybe said in May 2018 that Q400s would form the “backbone” of its future fleet as part of a wider plan to reduce its fleet to about 70 aircraft by early 2020. Earlier this year, the airline was bought by Connect Airways, a consortium made up of Virgin Atlantic, Stobart Group and Cyrus Capital. It is expected to provide feed for Virgin Atlantic’s long-haul operations. The announcement about changes to its UK bases came on the same day Flybe cancelled a string of flights. It blamed the cancellations on “a combination of factors including seasonality, pilots' end of leave year, Easter holidays, base restructuring and the shortage of pilots across the industry”.